We offer professional, discreet security services for all your protection needs. Patman Productions is fully licenced, bonded and insured and has a proven track record. ALL of our security personnel have successfully completed security training. They have established quality problem solving and public relations skills. Technology allows security staff to problem solve and maintain control through effective communication. 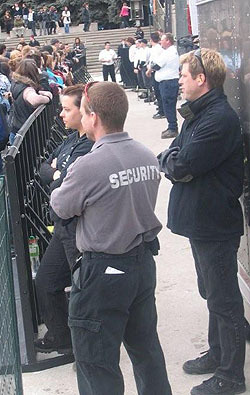 Our security personnel are dressed in basic black, or grey for supervisors, with a crested shirt front. This enables them to blend into the background and not draw attention from the event. We also offer Event Staff. With the same attitude they are able to augment our security personnel. With a watchful eye and a friendly smile, they provide extra manpower to the event. We take pride in our friendly, approachable, secure reputation and present ourselves as ambassadors of our client. "A Low Profile Confident Presence"